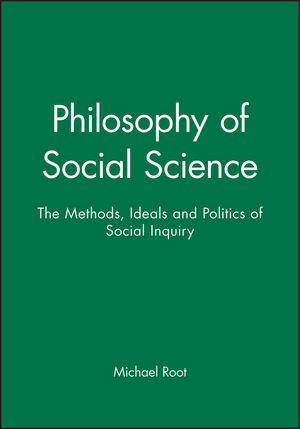 This book is a critical introduction to the philosophy of social science. While most social scientists maintain that the social sciences should stand free of politics, this book argues that they should be politically partisan. Root offers a clear description and provocative criticism of many of the methods and ideals that guide research and teaching in the social sciences. Michael Root is Associate Professor of Philosophy at the University of Minnesota. 2. Max Weber and the Methodology of the Social Sciences. 3. Theories of Development in Psychology and Political Science. 4. Functional Theories in Sociology and Biology. 5. Rational Choice Theories in Positive and Normative Economics. 6. Collecting Data in the Social Sciences. 7. Sorting Data into Kinds. 10. Social Science and Perfectionism. * A critical introduction to the philosophy of social science. * Descriptive and critical assessment of methods - ideals of social science. * Provocative and controversial thesis.